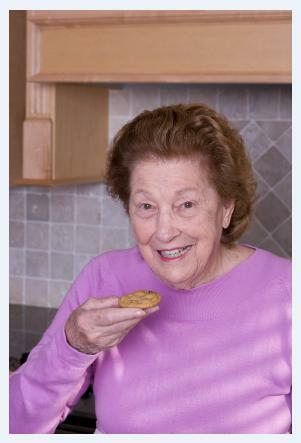 Senior nutrition is a major concern amongst both family members and homecare providers. In earlier stages of life, meals are often centered around social time: we make dinner for our family and eat together, or prepare lunches to tote off to work. However, once seniors are left alone in their homes, there is an increasing amount of evidence emerging that they are less likely to eat properly. Why? Some senior citizens report a lack of interest in cooking for one. They feel that preparing a nutritious meal for just themselves is too much effort, and instead forego eating, or eat a less nutritious “snack.” These habits may leave seniors underweight from a lack of nutrition, or overweight from consuming the wrong kind of nutrition. Older generations are accustomed to a lifestyle of not wasting, due to their remembrance of a time when resources weren’t always available. This mindset can transition into elderly individuals not cooking for fear of wasting leftovers. Eliminating the social interaction centered around meals makes eating a “necessity” for many seniors, opposed to a pleasant time of day. When it’s difficult to stand on your own, making a sandwich to eat alone becomes a major chore. Nearly every family caregiver that we talked to listed nutrition as a primary concern in the wellbeing of a senior loved one. Thus, homecare agencies who direct focus to nutrition can help ease the worries of a vast majority of family caregivers. How? While working in a client’s home, prepare nutritious meals and snacks based on their dietary needs. Caregivers working with clients who suffer from diabetes or any other dietary restrictions should be properly trained on what is, and isn’t, safe for their clients. Working with the family to develop a meal plan is also helpful, as single-serve portions of meals can be sealed in disposable containers for easy “re-heat & eat” when caregivers are not on-duty. Caregivers can make eating fun again for seniors by making meal time a social event while on duty. Encourage your employees to sit with seniors while they eat and talk. Caregivers can use the time to listen to stories from the past, chat about how the client’s been feeling lately, or just gossip about last night’s TV line-up. As evidenced by our survey of family caregivers, families want to know what, and when, their loved ones are eating. Utilizing ClearCare homecare software allows your caregivers to update meal tasks within a client’s care plan in real-time, with updates being immediately available to you, the care manager, and the client’s family. When agency administrators, caregivers and family members are all keeping an eye on what seniors are munching, we can work together to ensure that seniors are eating, and eating well.